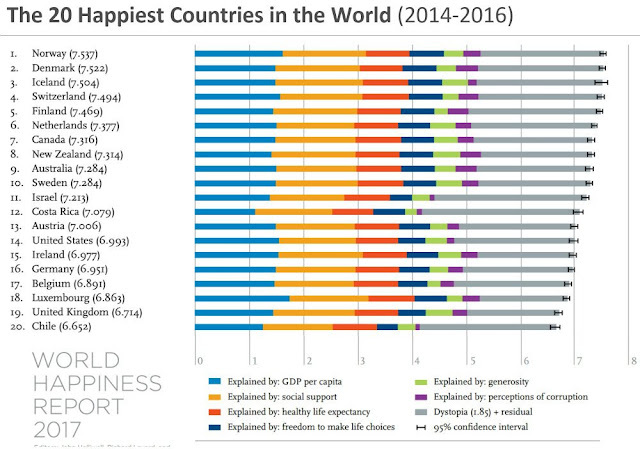 According to the World Happiness Report for 2017 [link], the happiest place on earth is officially Norway. As of March 29 of this year, the United Nations estimates its population to be 5, 315, 405. 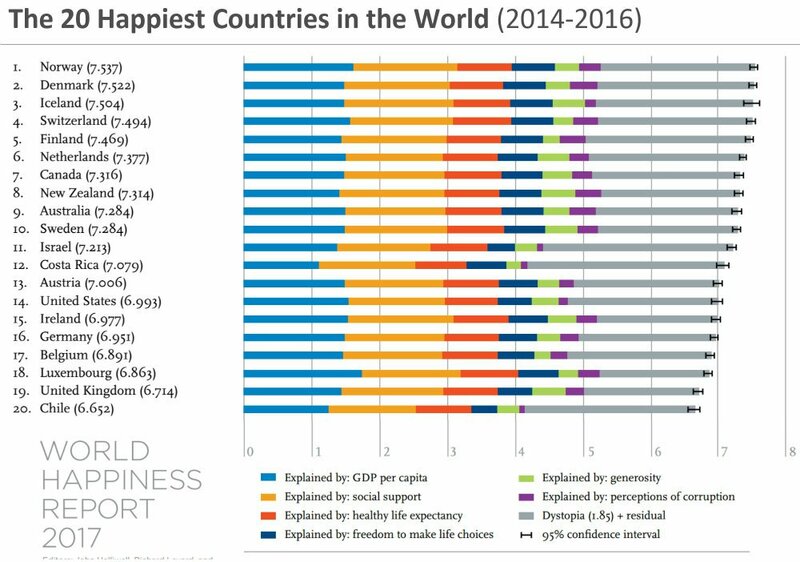 [link] Norwegians as a whole are happier than anyone else on the planet, or at least that's what the WHR would have us believe. According to Jeffrey Sachs of Columbia University and director of the Sustainable Development Solutions Network [http://unsdsn.org/], the key to human happiness is sound government policy (ie. Socialism). Trust, not guns or walls, says Sachs. The report puts Donald Trump's America, the country to which lack of trust, "guns" and "walls" probably alludes, on the list at #14. Canadians are officially the seventh happiest people in the world, for what that's worth. Some things in the above info-graphic seem straightforward and objectively measurable, like GDP per capita and healthy life expectancy, but the others, like 'generosity', 'freedom to make life choices,' 'perception of corruption,' and 'dystopia' are too esoteric to appear in any kind of empirical study. No, I don't think it's possible to generate a World Happiness Report that can really do what it suggests. To suggest that Norwegians are objectively happier than the rest of humanity because of their Euro-socialist government is an insult to the intelligence. What about Chile? Chileans have had a socialist government since Allende was elected in 1970, and Chile is dead-last at #20. Plenty of guns under Pinochet. Not a whole lot of trust during the Pinochet regime. Plenty of walls in Pinochet's Chile too, both literal and metaphorical. I have no interest in earthly utopias nor whatever system of human governance is proposed to achieve them. Canada, my home and native land, is well on its way to becoming the first post-national state. Justin "Sunny Ways" Trudeau has told the press that our heritage is now "pan-cultural" and in no way related to English or French explorers. Our Judeo-Christian heritage is null and void. Our national history has been wiped clean and is being brazenly replaced with Progressive Neo-Marxist imagineering. Political borders are now imaginary lines that don't mean anything. I repeat: I have no interest in earthly utopias. True, lasting happiness is not of this world, and cannot be achieved in this world by political means. The utter impossibility of the Utopian dream witnesses to the fact that man is *not* the measure of all things after all. If the world described in John Lennon's "Imagine" was achievable, he would have never been inspired to write it because it would have already come to pass long before he was born. The word itself, which in Greek means "no place" would have been nonexistent. The concept behind it would have been a non sequitur. The word "anarchy" would not exist in a world where Rousseau Is Always Right. You might think that all of this yearning for bliss in the hereafter is magical thinking, a way to escape the agony of life. You might opine that this yearning is at best a distraction from the business of enjoying life in the present moment and at worst the anti-life equation. I understand, I do! 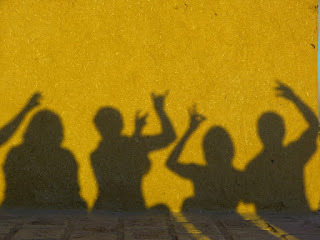 Love, joy, peace, patience, kindness, goodness, generosity, faithfulness, gentleness and self-control are what we call the fruits of the Holy Spirit. Each of these are realized in the present moment ... the Kairos moment. In the chapter called "Hope" in C.S. Lewis' Mere Christianity, the author gives us the following advice: “Aim at Heaven and you will get earth ‘thrown in’: aim at earth and you will get neither.” Those of us who are aiming ourselves at the Lamb of God have been told to expect a place prepared for us in our Father's house, a mansion built from the worthy life we're building on earth-- right here and now. Eternity doesn't have to wait until death because it is present within every moment if we could only be still and know.